Yes, it’s a real place! Jaded denizen of the interwebz that I am, there’s not much that makes me leap out of my chair and scream “WANT!” but when I first saw a picture taken at Zao Fox Village, I had to drop everything and figure out a way to get there. Yesterday, I finally LIVED THE DREAM! It’s far from Tokyo – five hours by car – so we didn’t arrive until mid-afternoon. As soon as we got there, we bought admission tickets at the counter (¥1000) and a few little baggies of fox food to take into the fox enclosure (¥100 per baggie). As we stepped outside and saw the cages in the courtyard, I understood how it feels to win the lottery: in addition to the usual number of swoonworthy kitsune, 86 new foxlings had been born since March! This is what a nearly unbearable amount of squee looks like. Pinch me! Pinch me! 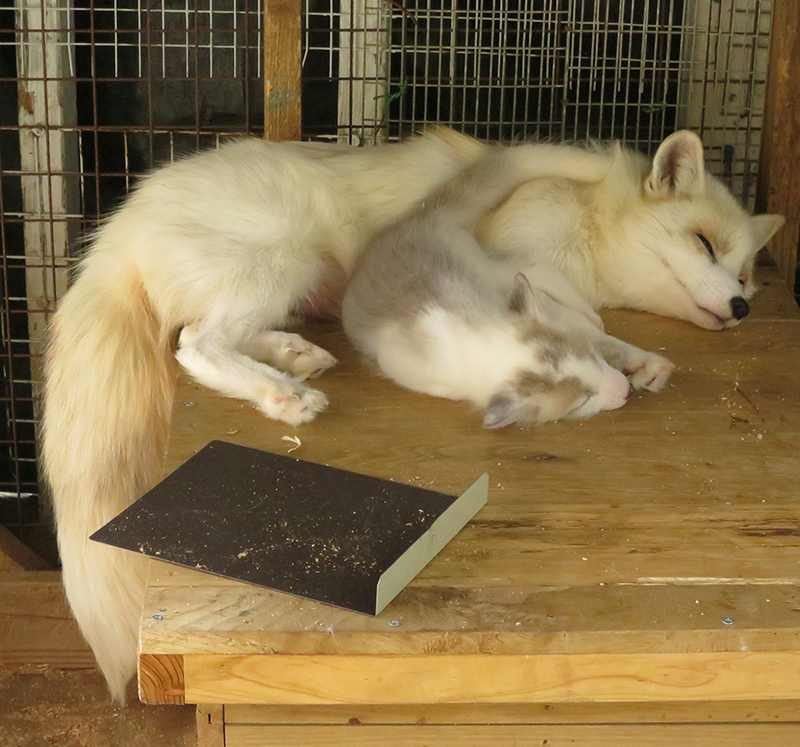 This anime-esque fox mama & baby are real! 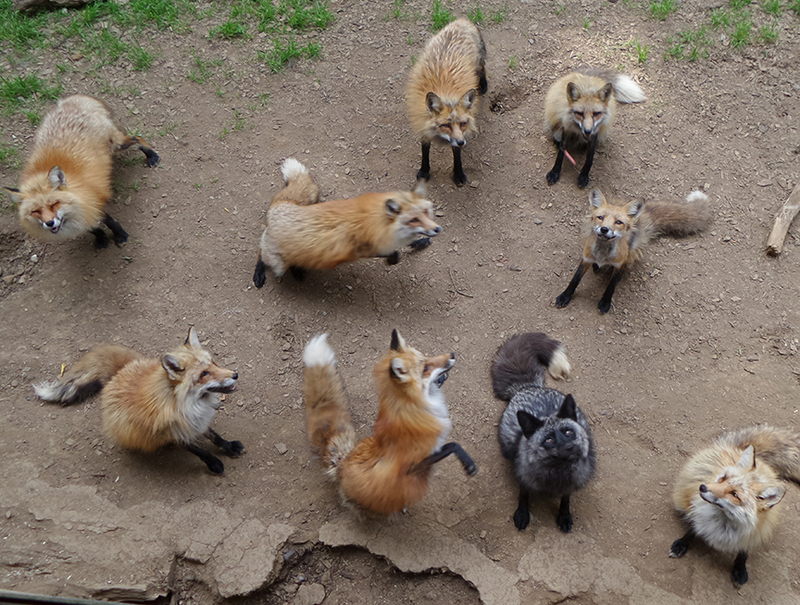 Once they hear the crinkle of food baggies being opened, foxes come running from all quarters and assemble eagerly below. 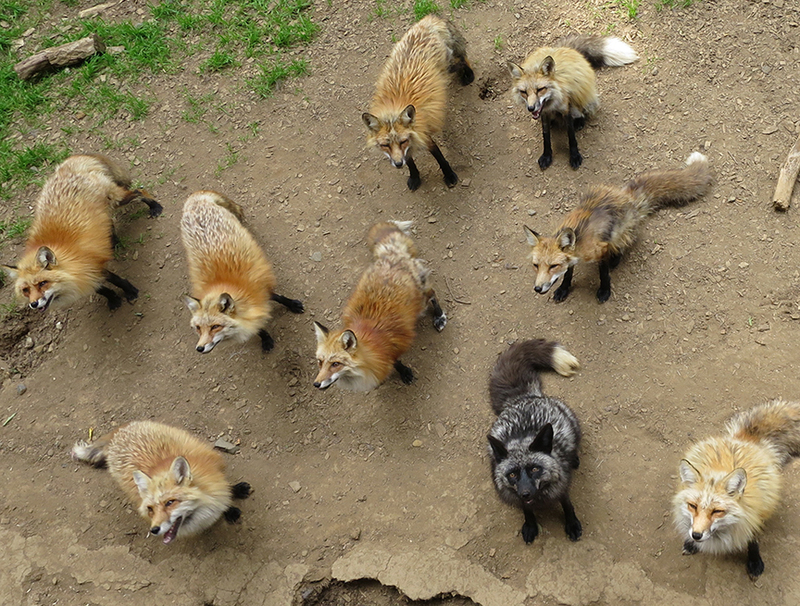 I was surprised by how many different kinds of foxes there were. Not just the red kind, but black ones and brindle ones and white ones too. I’ve never seen a fox for more than a few fleeting moments in the wild, but since they’re related to dogs, I expected them to be dog-like in more than just looks. I was so wrong. 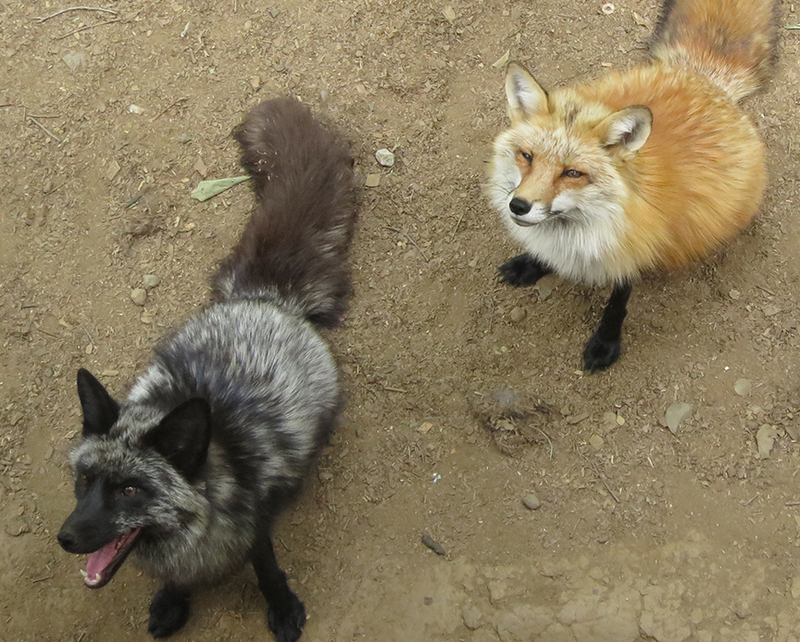 The ones at Fox Village not only grin like Cheshire cats, they move like cats and their cries aren’t bark-y at all. In fact, “cry” is a perfect way to describe it – at times, they sound eerily like babies. In the wild, foxes are nocturnal. So, for every fox running around at three in the afternoon, there must have been five foxes sleeping. In fact, when I first stepped into the fox habitat, I was like, wait, where are they? The place looked deserted. Then foxes began peeking out from behind the trees, and I saw that little piles of fur were curled up everywhere, sleeping in shady spots. Note: To be honest, I was a little worried about what I’d find when I got to Fox Village, because a few online reviewers thought the foxes weren’t being treated well enough. I was relieved to discover that all the foxes I saw looked fat and happy, and lived in a huge grassy area filled with structures and toys to sleep on and play with. I can also report that there were filled water troughs sitting around everywhere. 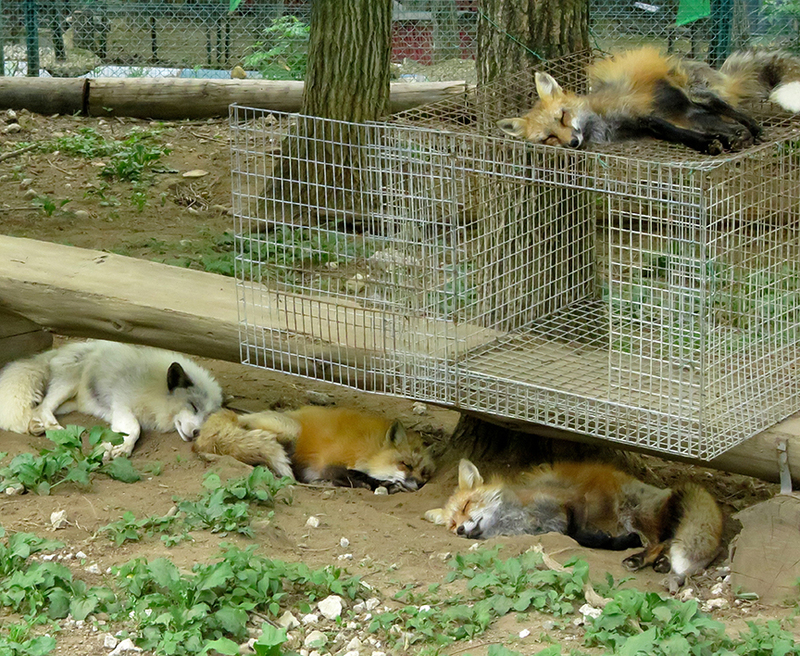 In addition to the big landscaped habitat, there were quite a few foxes in cages in the courtyard beyond the cashier. Those animals were either being treated for illnesses (one looked obviously under the weather because it had an ear infection) or were mothers with kits. The mothers can become quite aggressive after their babies are born, so they’re separated from the rest of the population for everybody’s safety. Fox Village In The Snow is here! To get there, plug your nearest station into the Train Finder or download a free Japan Travel mobile app to your phone (I use Navitime Japan Travel) with Shiroishizao Station as the destination. • The next-easiest way is to take the train to Shiroishizao Station and then catch a taxi from the station. It’s about a 20-minute ride, and costs between ¥3500 and ¥4000, each way. The cab drivers don’t seem to mind driving out to Fox Village at all, and you can arrange for them to come back to pick you up at a certain time, if you like (which is especially handy if you don’t want to make a phone call in Japanese AIEEEEE). Fox Village really is out in the middle of the nowhere, so it’s a good idea to have an exit plan, since you can’t really go out and hail a cab on the road outside when you’re ready to leave. 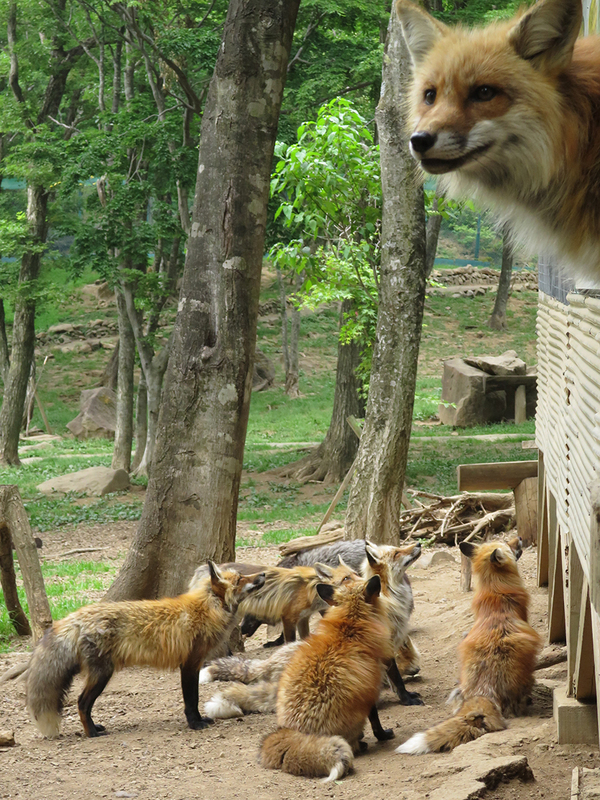 • If you’re really on a budget and want to take the bus, you’ll need to go on a Tuesday or a Friday, because that is the only day the public bus goes from Shiroishi (NOT Shiroishizao) train station to Fox Village. The bus costs ¥200 per person. It leaves Shiroishi Station at 7:58 a.m. and arrives at the Kawaragodamu bus stop (outside Fox Village) at 8:55 a.m. Be sure to mention to the bus driver that you are going to Fox Village (Kitsune-mura) or he won’t stop. There is only one pick-up in the afternoon, at 1:55 p.m. The staff at Fox Village will show you where to wait for it. The bus arrives back at Shiroishi station at 2:32 p.m. Note: I checked the train schedule, and the first bullet train from Tokyo arrives at 8:26 in the morning, too late to catch the bus to Fox Village on the same day. Unless you arrive the night before, you’ll probably have to take a taxi to Fox Village. You can still save money by taking the bus back in the afternoon, of course. It’s always good to doublecheck Fox Village information before you go, in case there are any special circumstances (road closures, etc.) 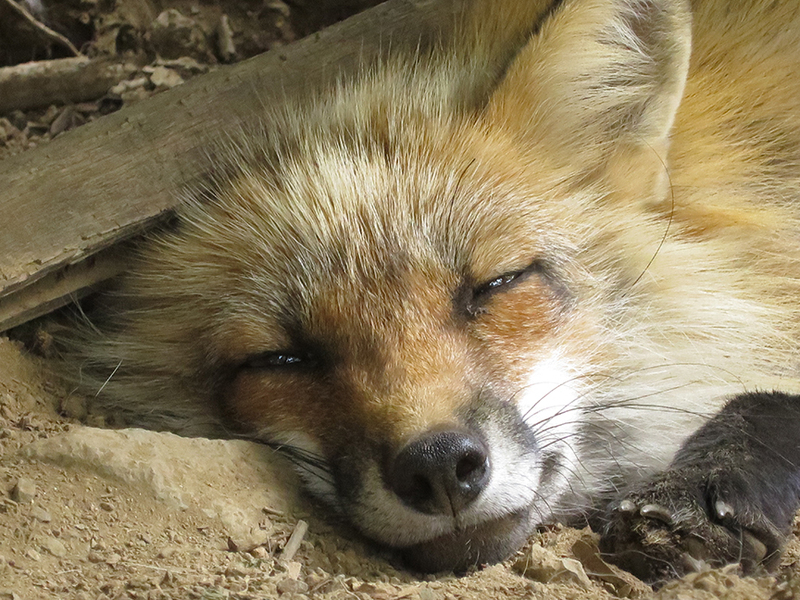 so here is a link to the English page on the Fox Village Website. 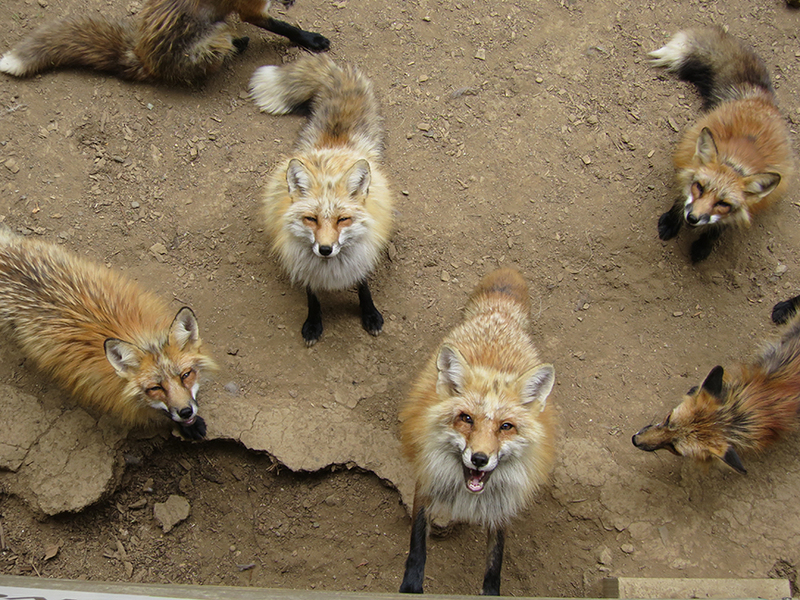 – Hide the food when you are walking around in the fox habitat and only feed the foxes from the platform. 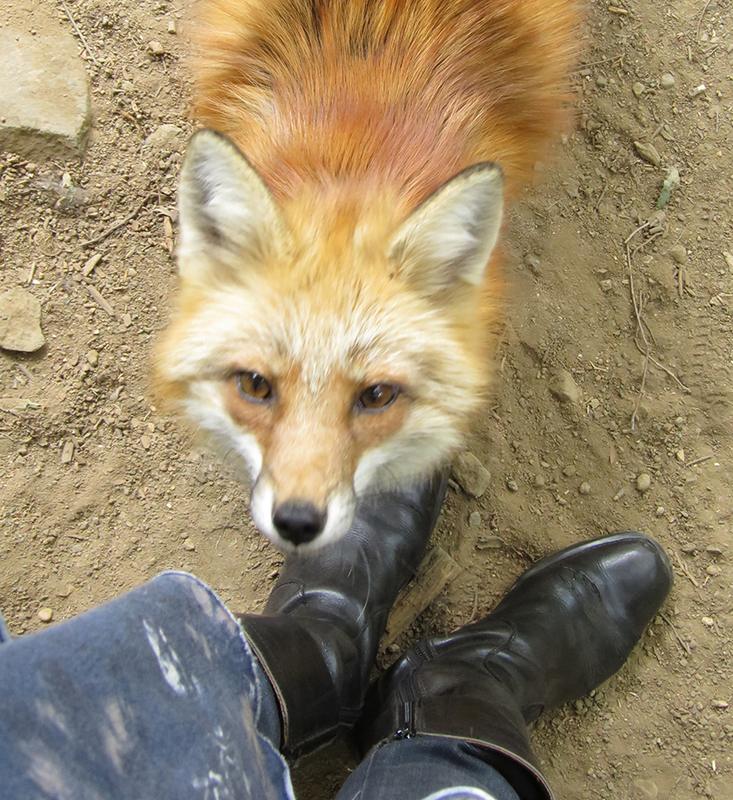 (This is so they don’t learn to mob visitors – the foxes are not tame, and they can bite, so if they learn to grab food from visitors, it will be too dangerous for visitors to mix with the foxes anymore.) Children are especially vulnerable, so please be sure they understand this rule. – Don’t stick your fingers into the cages. Even baby foxes bite, and fingers look especially appetizing to them. • After that, go through to the courtyard beyond, where they keep the foxes being treated for injuries/infections and the baby foxes (Mar – July). They will show you the door to the fox habitat to your right. • You can roam freely around among the foxes in the habitat, for as long as you like. • Afterwards, exit through the gift store, where they sell all kinds of Fox Village candy, good luck charms and souvenirs. Here’s the swag I couldn’t resist on my way out! OK, I thought there could be nothing more squee-worthy than a kitten. I guess I was wrong. Now I want to go there. It’s a huge schlep, but so worth it! One of the best things I’ve ever done in Japan, and there’s some stiff competition for that. I’ll give you that! You’ve certainly gotten around more than I have. My work is a lot more flexible than yours, I suspect! 😛 But yours pays better, and I remain deeply deeply envious that you are a permanent resident here. OMG. Every time I see a fox in the wild it takes me a couple of seconds to register what I’m looking at. It’s such a rare and wondrous sight. I would love to visit this place. I think I must share this link on FB. Reva, I’m the same way! I’ve only seen foxes in the wild about three times, and it’s never for long enough! 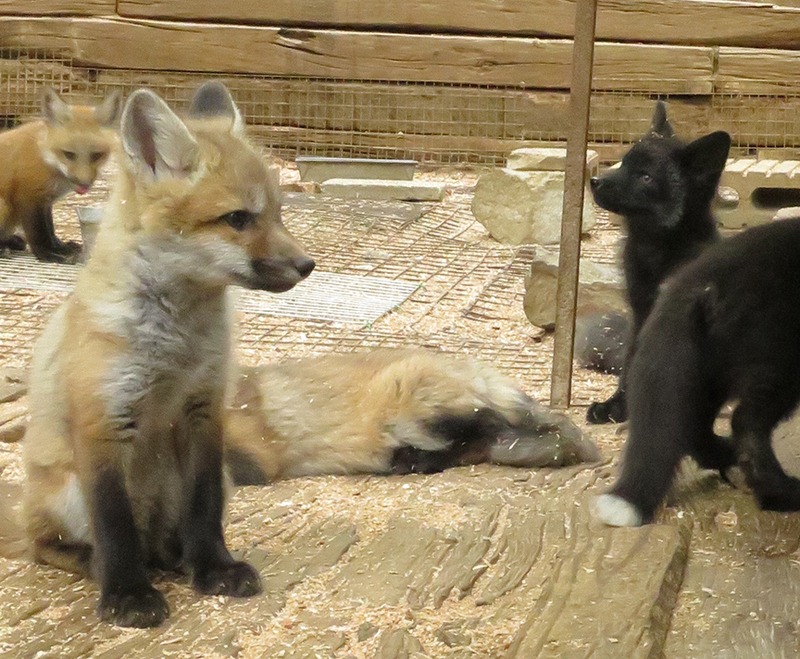 I was in heaven at Fox Village, because you can stay as long as you like, and roam around among them, and there were over a hundred of them all in one place! ! OMG! This is fantastic! I don’t think I’ve ever seen a wild fox. Seeing so many at once is just fabulous. I’ve always thought foxes were more like cats than dogs (and because of our name, my family collects fox things, books about foxes, etc.) Thank you! It’s so much fun to find other people who love the same stuff I do! （＾Ｏ＾☆♪ I too have always loved foxes, and not seen nearly enough of them. Somehow, they are not usually in zoos (at least in the U.S.) but they’re very rare to see in the wild too. It was such a thrill to see so many at once. They have foxes in Adelaide? 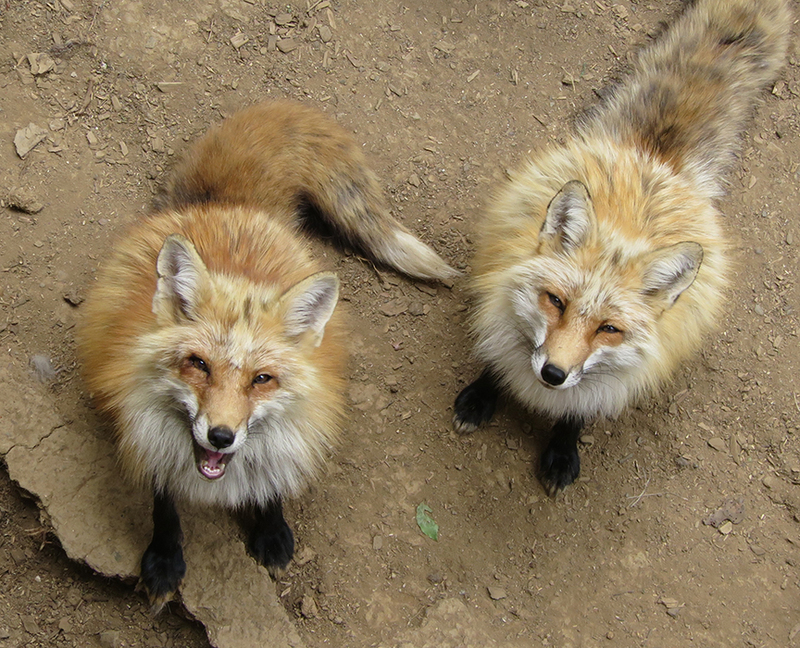 if I could see foxes more often, I wouldn’t even care if they weren’t as cute as Japanese foxes! I’ve only seen foxes twice in San Francisco. Foxes also appear frequently in the city of Sapporo, often looking for food in cemetaries. My neighbor got in trouble for feeding a fox which began to show up regularly. It is important to be very hygienic around wild foxes as they carry a deadly communicable disease, transferrable through the water they drank from. Thanks for the info, really useful! I think we will take the shinkansen to ShiroishiZao and spend a night there, then catch the bus on Friday morning to the Fox village. they’re so cute, I think it’s worth the trip! That should be really stunning looking~ ive seen some pictures of foxes in the snow on another blog (L). We will be there by mid-April though. Maybe you can update with more new pictures or write more about it :p Foxes are so cute!!! Keep your fingers crossed for me! It’ll all depend on the weather and if the roads are clear enough to get through (><;;) I'll definitely post a TON of pictures if I get there! But April is a great time to go – the foxes should still be fat and furry from the winter (spring comes late to the mountains) and there might even be fox babies you can hold! Great piece! Really enjoyed reading this and I too was concerned with the negative reviews regarding the treatment of foxes so its reassuring to know that is not the case! 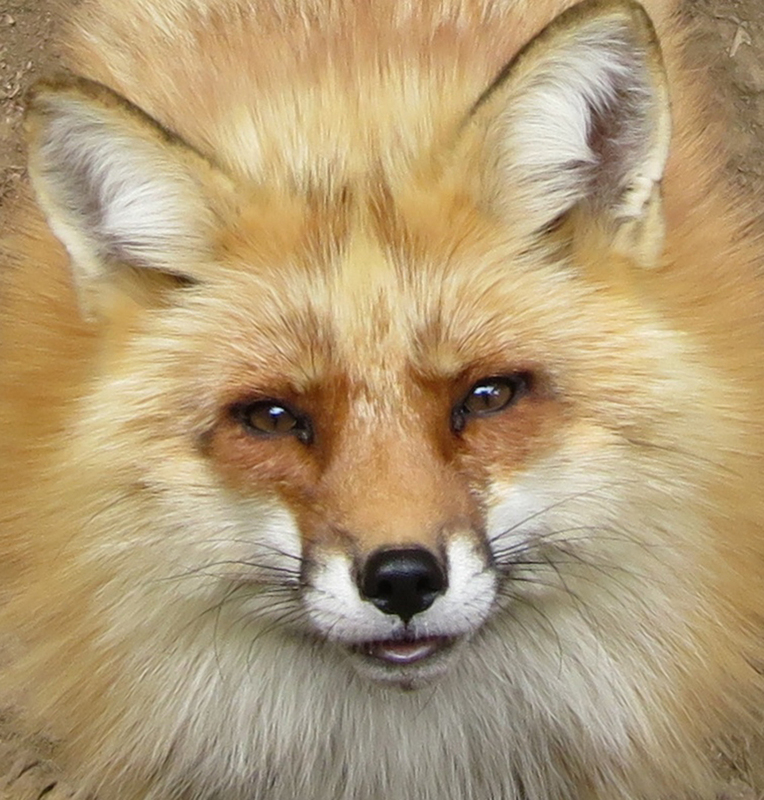 We are considering driving to Zao Fox Village from Tokyo in the middle of December. Is it a relatively easy/safe drive in Winter? I’m so envious you’re planning to go in the winter! That’s really the best time – the foxes are very fat and furry then. I’ll keep my fingers crossed that you have clear weather and a wonderful visit, though! Good luck! I have seen wild foxes since i was a child wherever we were. I am an expat residing in Europe and they appear to me here as well. 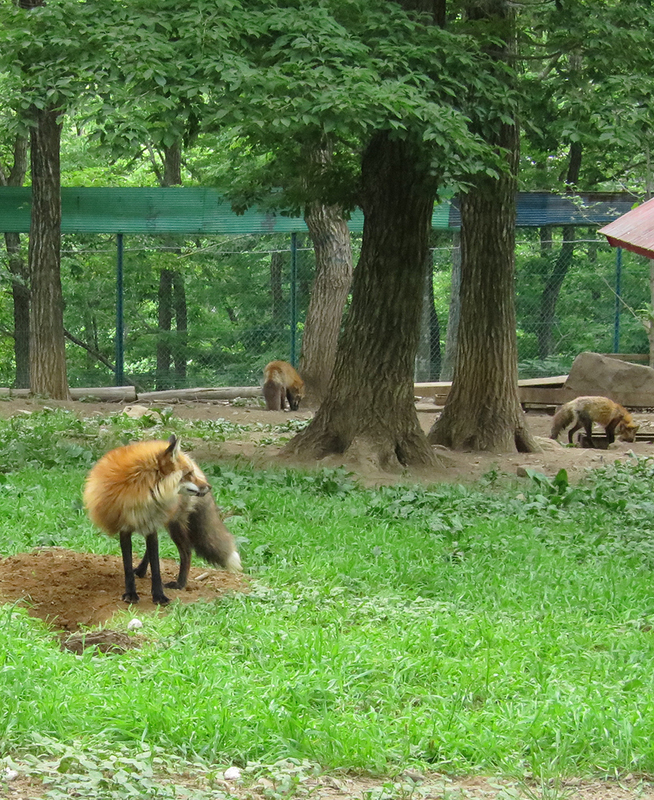 I cannot wait to go to Japan this summer to foxtown. 🙂 they are just like dogs i looooove them so much. i had a bond with a fox when i lived in Denver for a year; as an artist I am flexible with my schedule, walking my dog at all hrs and this fox would appear(they have a 1square mile radius) -within a two block radius and stop and look at me five out of seven days a week! It was such an amazing experience as I realized I have a powerful connection with this animal. When I lived in San Francisco, Maine and MD I saw them occasionally but it was in Denver that I realized I had a bond:) soooooooooo cute! I traveled an incredibly long distance to come here and was mislead by the information you provided. The bus departs from shiroishi station NOT shiroishi zao station like you mentioned. I missed my one and only opportunity to see them. Thanks. Oh no, oh no, that’s AWFUL, I am SO SORRY I gave you the wrong information! If I’d gone all the way to Shiroishi Zao and missed the bus because a blogger gave me the wrong station, I would be beyond angry and disappointed. I am really really sorry. I’ve never taken the bus myself – we always took a cab from Shiroishi Zao station – so I must have gotten the station name wrong when I translated the information from the Fox Village website. Thank you for telling me the right station – I will correct it in the blog post right now so nobody else has a disappointing experience – but I’m so sorry that you missed your chance to see the foxes because of me. I am truly horrified, and hope you have another chance to see them sometime soon. Would like to go there next October, maybe on 13th.. I plan to rent a car, Just want to know, is the park big ? How long would you recommend for a visit ? And do you know any sightseeing around this place ? I search, and I found zao onsen, but i think it’s a long wayyy to go. any rec ? Fox Village isn’t actually that big – if there was nothing to see, you could walk around it in less than ten minutes. Fortunately, it’s filled with foxes (plus a platform for feeding them) so it’s easy to stay for a few hours, watching them and taking pictures. The whole area is mountainous and it’s far enough north that the leaves might be starting to turn red and yellow by mid-October, which makes it nice for hiking. The first time I went, we came by car. It takes a long time to drive there from Tokyo – about five hours, compared to two and half on the train plus a 20-minute taxi ride. We got to Fox Village around 2:00 in the afternoon, spent about three hours there, then kept going north to one of the many nice onsens in Miyagi-ken. (I don’t remember the name of the one where we stayed, but I think there are sites where you can find them online).The next day we drove over to the sea and back toward Tokyo through Ishinomaki and the tsunami zone (which is still terribly devastated) and then stopped at Nikko, at the Toshogu Shrine. Hope you have a great time, however you go! It’s worth the trip, I think! Hi, I plan to drive there from Tokyo as well. Does that mean there’s a carpark at the fox village? I read somewhere suggesting parking near Shiroishi station and taking a cab there instead. The first time I went, we came by car, and I remember there being a nice, big car park right in front of Fox Village. Unless things have changed recently (did the piece that recommended taking a cab give a reason? ), it’s much faster and cheaper to drive there yourself instead of taking a cab. My wife an I are travelling to Japan in April 2018 and will be staying at Ikebukuro for 4 days. Since staying the night near Zao Village is out of the question, can you help me plan a trip to Zao Village? How early should I leave from Ikebukuro? How much time would the trip take? The arrival station should be Shiroishi right? And then a taxi? We’ll be having a Japan Rail Pass. Thanks in advance! Enter the station you’re leaving from (Ikebukuro), the station you want to go to (Shiroishizao), and the date you want to go. Then enter the time you want to arrive and below that, click the button for “Arrival.” Then click “Search.” If you don’t like the options, try changing the arrival time and search again. The results will give you one or more ways to get there by the time you asked for. It will give you the time your train leaves, how long it will take to get there, and how much it will cost (one way). It will also tell you where and when you have to change trains, and how much time you have to do it. In my experience, this app always allows a reasonable amount of time to find the new platform and get there, even if you’ve never been to that station before. Every station in Japan has signage in English as well as Japanese these days, so all you have to do is follow the signs. You can do the same thing for your return trip, putting “Shiroishizao” in the “From” box and “Ikebukuro” in the “To” box, only this time, click the “Depart” option and put in the time you want to leave. If you take a screen shot of the itinerary you want, you can show it to the reservations clerk when you make your Japan Rail Pass reservations, and that way, you’ll be sure to get reservations on the right trains. Hope you have a great time, and let me know if any of that isn’t clear enough! Thanks! This will be our second trip to Japan, so we have a bit of experience with their stations. 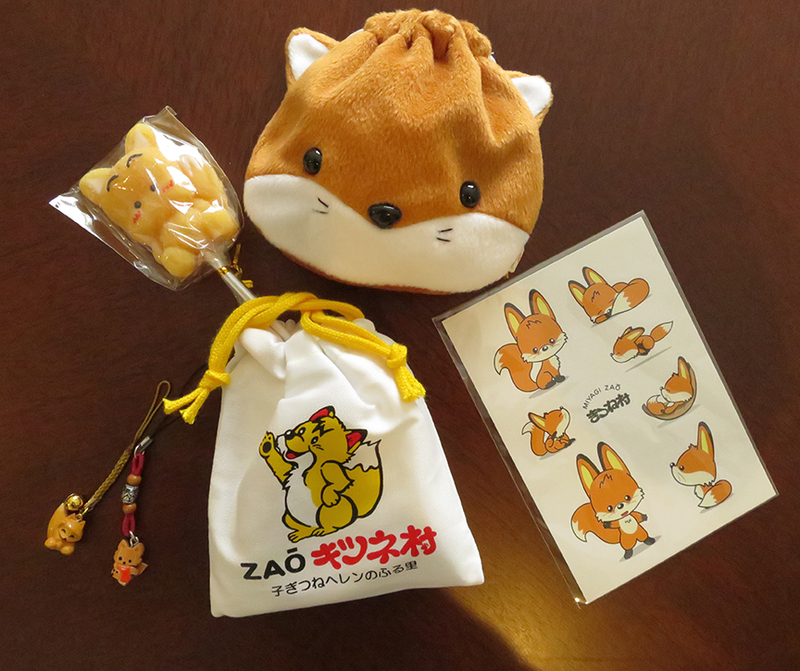 Thanks for the webpage, it will be a great help to plan a trip to Zao Fox Village.